For much of its history, British cinema was deemed second-rate and unworthy of critical and popular attention. The resultant lack of care and research produced an incomplete history, which now has finally been addressed. The introduction to the first edition of The Encyclopedia of British Film (2003) claimed that “the purpose of this book is to fill a gap” (p. xi). Some two years and a second edition later, it can safely be said that the gap has been filled. The breadth and variety of British cinema, as well as the depth of scholarship in the field, is illustrated in these two volumes – the Encyclopedia and The Cinema of Britain and Ireland – both expertly edited by Brian McFarlane. The second edition of The Encyclopedia of British Film provides a welcome update and an expansion of this comprehensive reference book, designed to act as “the first port of call” (p. xiii) for anyone wishing to pursue an interest in British cinema. With over 5,800 entries, 200 of which are new to this edition, McFarlane sets out in the preface his central aim of being as contemporary and comprehensive as possible. His editorial policy is one of bold inclusiveness, particularly at either end of the historical spectrum. The early period is now receiving more critical attention than ever before, and some careers are listed here for the first time, such as 1930s producer George Smith. Similarly, and with an acknowledged need for clairvoyance, a number of contemporary filmmakers are included whose output is still relatively small, but who show signs of interest and promise, such as director Edgar Wright (Shaun of the Dead, 2004) and actor Romola Garai (I Capture the Castle, directed by Tim Fywell, 2003). Time and continued production will prove the worth of these entries, but for now their listing gives future critics a place to begin. McFarlane is forced to tackle the issue of exactly what is meant by “British cinema”. With the complexities of film finance, and the movement of international personnel, it is difficult to answer such a question without making arbitrary judgements. His approach seems entirely sensible given the difficulties and debates surrounding the singular concept of “National Cinema”, and with the book’s stated aim of acting as a “first port of call”. McFarlane notes how few wholly film careers there are, and highlights British cinema’s links to theatre, and latterly, television. These links, and the importance of context and industrial shifts to the history of British film, are acknowledged in the entries’ biographical text, and highlighted in the growing list of thematic entries (e.g. “Documentary film in Britain”; “Americans in British Silent Films”). The entries themselves provide a raft of information. For example, Andrew Spicer’s entry for Ivor Novello notes his early career in song-writing and musical theatre, expands on his screen career in the 1920s, has a full list of his British films, highlights Jeremy Northam’s portrayal of Novello in Gosford Park (Robert Altman, 2001), and then points the reader towards a select bibliography. As a “first port of call”, it is comprehensive. McFarlane’s passion for the subject, combined with the infectious enthusiasm of the contributors, is evident throughout the text. The entry for Timothy Dalton, for example, reads: “Actor. Tall (6’2”), dark and improbably handsome, like the old-time film idol he never quite became” (p. 165). Such detail and vivacity bring to life the characters of British Cinema, while the entries remain critical, interesting and wholly accessible. While less exhaustive, the British Film Institute’s multimedia Screen Online Project features entries on many major personalities, often with biographies taken directly from the Encyclopedia. There is not the same breadth of coverage of more minor players, but the multimedia links allow the researcher to easily grasp where each person fits into the interconnecting web of themes and relationships. While the Encyclopedia – with its beautifully presented text and photographs – is essential for anyone with an interest in British cinema, there is probably not enough new material to justify upgrading if you already own the first edition. The Cinema of Britain and Ireland is part of Wallflower Press’ admirable 24 Frames series, and constitutes 24 essays by leading academics which highlight important themes within British cinema through illustrative case studies of neglected or forgotten films. The chronological spread runs from Luke McKernan’s analysis of the late silent film Shooting Stars (Anthony Asquith, 1928) to Dave Rolinson’s essay on Sweet Sixteen (Ken Loach, 2002) (1). While McFarlane notes that “each film ought to suggest something of the range of British filmmaking over a long time” (p. 4), and McKernan’s essay certainly illustrates the state of British silent production in the 1920s, it remains a disappointment that no earlier silent films are discussed. Sadly, this reflects the paucity of surviving material from the silent period. The use of an unknown or under-appreciated case study allows each contributor to branch out and discuss the wider contexts and themes the films represent. Andrew Spicer’s essay on Demons of the Mind (Peter Sykes, 1972) finds qualities that set it apart from more famous Hammer horror products; Phillip Gillett’s chapter on The Rocking Horse Winner (Anthony Pelissier, 1949), and Rose Lucas’ on Orlando (Sally Potter, 1993) demonstrate British cinema’s compulsive and difficult relationship with literary authors (2). Martin McLoone reassesses the legacy of Robert Flaherty’s 1934 documentary Man of Aran. Flaherty’s method was criticised by British critics for dramatising and romanticising a subject masquerading as “real”. In Ireland, however, Flaherty was lauded by nationalists for his “unsentimental portrayal of the Irish – the documentary truth of his vision of the Aran islands” (p. 45). McLoone notes that this vision dove-tailed with sentiments of Irish nationalism, and Éamon de Valera’s concept of Irish self-sufficiency, a perfect example of the case study format illustrating the wider themes and context of the film’s production and reception. Such contradictory discourses are still familiar in documentary filmmaking, and perhaps reveal more about Ireland at the time than about the merits of the film itself. The essays on more recent Irish films demonstrate the diversity of critical practice which is emerging: Kevin Rockett’s auteurist approach to the films of Neil Jordan; John Hill’s essay on Divorcing Jack (David Caffrey, 1998), which highlights new production practices in Northern Ireland; and Emer Rockett’s re-evaluation of Ordinary Decent Criminal (Thaddeus O’Sullivan, 2000) as a culturally-specific postmodern text which remains essentially Irish. Despite the range of these films, there is within them a recurring challenge to the nostalgic, mono-cultural representation of Ireland on film. Let us hope, as McFarlane does, that these essays contribute towards continued growth in Irish cinematic production and academic interest. If the “gap” in the history of British (and to a lesser extent, Irish) cinema has been filled, then in its place is revealed a rich and diverse cinema, which makes François Truffaut’s famous remark about the incompatibility of “Britain” and “Cinema” appear redundant. Under McFarlane’s editorship, these two volumes demonstrate the variety of research and writing on British cinema. Such work promises to continue to unearth forgotten gems. A flick through either of these volumes left me wanting to explore unknown works and personalities, and revisit familiar ones with a new perspective. That, surely, is the mark of good criticism, and a cinema worthy of attention. 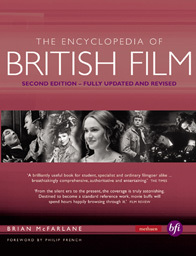 The Encyclopedia of British Film, 2nd edition, edited by Brian McFarlane, Methuen, London, 2005. 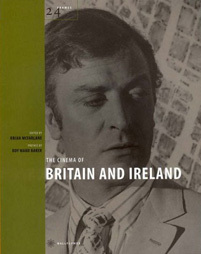 The Cinema of Britain and Ireland, edited by Brian McFarlane, 24 Frames series, Wallflower Press, London, 2005. There is some disagreement regarding the year for Shooting Stars: while some sources cite 1927, it is cited as 1928 in McKernan’s essay. For this review, we will adopt the year as cited in the publication under consideration – Ed. As with Shooting Stars, there are two years commonly cited for Orlando: 1993 is cited twice in Lucas’ essay, whereas in The Encyclopedia of British Film the entry for director Sally Potter cites 1992. Again, we will use the year as cited in the relevant publication being discussed by the reviewer. The problem of dates is addressed in McFarlane’s introduction to the Encyclopedia – Ed. Daniel Gritten is a PhD candidate in the Department of Drama: Theatre, Film and Television at the University of Bristol. His doctoral work focuses on screenwriting manuals, and the development of screenwriting practice in British cinema during the 1920s and 1930s.